NOVOAMVROSIIVSKE, Ukraine -- With cameras and clipboards in hands, teams of blue-jacketed international observers drive around the muddy countryside of eastern Ukraine looking for rocket launchers and artillery. 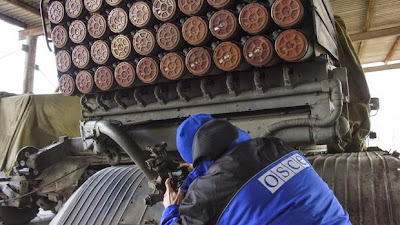 An OSCE monitor inspects Grad rocket launchers stored by pro-Russian rebels in the village of Novoamvrosiivske, eastern Ukraine, Friday, March 20, 2015. The OSCE was tasked to verify the pullback of heavy weapons by the Ukrainian government forces and the rebels in eastern Ukraine under a cease-fire deal. Their task is to verify whether government troops and Russian-backed rebel forces are removing heavy weapons from the front line in accordance with a February cease-fire deal. The success of the Organization for Security and Europe monitoring mission would lessen the chances that heavy fighting will resume in conflict that has already left more than 6,000 dead in a year. Evidence is emerging, however, that the warring sides are leading monitors on a time-wasting game of hide-and-seek. Distrust between foes remains intense and anxiety lingers that a new flare-up could be just around the corner. On Friday, an Associated Press journalist saw two tanks and two 120 mm guns being taken toward the front in rebel territory, near the separatist-held city of Donetsk. Two days earlier, Ukrainian troops were seen transporting a tank and a large-caliber gun in the town of Avdiivka, which also lies right on the front line. None of the weapons should have been there. Under a peace deal laboriously negotiated between the leaders of Ukraine, Russia, Germany and France, anything with a caliber of 100 mm or above should be pulled back 25 to 70 kilometers (15 to 45 miles) from the front. The weapons withdrawal began the last week of February and both sides claim to have completed the process. But the OSCE says to make sure the pullbacks happened, it must know how many weapons each side has and where they are being stored. "Some information has been provided from both sides, but we still need substantial information," said Michael Bociurkiw, the OSCE mission spokesman. On Friday, a group of inspectors in rebel territory traveled from Donetsk to Novoamvrosiivske, a village near the Russian border where AP journalists on Feb. 26 followed four trucks carrying Grad launchers to a cement factory. In that same cement factory, monitors scrutinized dozens of tanks, rocket launchers and howitzers, eyeing serial plates, taking photos and writing down notes. Where serial numbers were scratched away, a photo was taken of that missing information. In separatist areas, OSCE teams have to ask in advance for permission to visit sites they wish to see and they travel under the supervision of rebel fighters. "They have complained to us that they can move around freely on Ukrainian territory," one rebel fighter, who gave his name as Major Yegorov, told the AP in Novoamvrosiivske. "That is true, but on that territory there is no fighting. The war is here, in the southeast. So we control them because we want to provide safety for them." It is unclear to what extent the OSCE teams are able to decide on their own where to inspect. On the road back to Donetsk after the Novoamvrosiivske inspection, fresh tracks on the asphalt in the Donetsk suburb of Makiivka appeared to indicate that a convoy of heavy machinery had passed through since the morning. The OSCE team drove past, but an AP journalist followed the tracks to find two tanks in a multi-vehicle convoy that included truck-pulled cannons and troop carriers full of rebel fighters. On Wednesday, two days earlier, a Ukrainian soldier told an AP reporter, laughing, that a cease-fire agreement-busting cannon that was being taken toward the front had a "90-something mm caliber." The weapon was clearly more powerful than that. Ukrainian military officials have at times conceded that they are refraining from a complete withdrawal of heavy weapons, citing what they say is rebel reluctance to do the same. "We will not withdraw all our weapons, as we have no confirmation that the same is being done by the enemy," military spokesman Colonel Andriy Lysenko told reporters March 11. "It would be wrong and criminal to leave our troops without any cover." And Ukrainian authorities say artillery fire continues in sporadic clashes along the front line. Donetsk region police chief Vyacheslav Abroskin said a resident of Avdiivka was killed Friday after a shell struck a home in the town. In addition, neither side is willing to agree that tanks fall under the weapons to be withdrawn, although the cease-fire clearly envisions their removal. Monitors complain daily that they are not being allowed to travel freely. Sometimes they are made to wait at checkpoints, forcing delays, while in more extreme cases they are blocked entirely from reaching their destination. Bociurkiw said even a short wait violates the verification process. "Any delays are unacceptable in our books," he said.